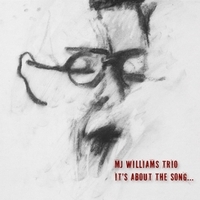 It’s About the Song is the 2014 release by the MJ Williams Trio. The CD is comprised of mostly standards, a Sting song, 2 Monk tunes and an original, Blues for a Bass Player in Paris. This is my composition about Kelly Roberti’s near mortal motorcycle accident some years ago. Kelly lived in Paris for a while and MJ wrote the lyrics about that city.